One might question a recommendation to spend time under a bridge, but when it’s the St Johns Bridge, which spans the Willamette River from North to Northwest Portland, it makes perfect sense. For decades after the bridge’s construction in 1931, the land underneath on the East side was undeveloped--and in fact it has a quite an unsavory history, with the kidnapping and murder of a teenage girl in 1949 and then the subsequent use as a Portland city dumping ground. Eventually in 1980, with funds raised by residents, the area was turned into Cathedral Park. It’s a fitting name. Looking up at the tall gothic arches that support the bridge, you can imagine yourself inside Notre Dame de Paris. From the right vantage point, the arches all line up and produce a telescoping effect, appearing small at the east end high on the hillside and growing taller and taller as the land slopes toward the river. The height of the bridge and depth of the space beneath are both exaggerated, and the resulting sense of volume is truly spectacular. The space between and outside of the arches is the real focal point. There’s an elemental feeling about the space. Land and water partner with the bridge’s architecture to suggest you’re inside a structure. It’s a magical feeling under the bridge. Most dry days you’ll find posing, smiling groups of people who have chosen the park as a backdrop for their photo shoots. You may even witness a wedding ceremony. Nearly a religious experience at Cathedral Park. The park is broad and nearly flat, etched with walking trails. Picnic tables, trees, and lampposts dot the landscape. The Willamette River flanks the Western edge, where you’ll find a boat ramp. There’s also a floating dock where you can fish or hang out and watch the water traffic. If you’re around mid summer, you can catch the free Cathedral Park Jazz Festival, which has taken place since 1980 and continues to draw large crowds. The height accentuates the vertical space. In a city of bridges, the St Johns arguably stands out as the most stunning and would be worth a visit on its own. Cathedral Park enriches the viewing experience and stands out on its own as a wonderful spot to chill out and take in a great slice of Portland. When you've taken in all the wonder and awe of the St. Johns Bridge wander up the hill behind the park to the small downtown area of St. Johns. You'll find ample tasty treats and unique shopping. Saturdays in the Summer there is a farmers market and overall wandering St. Johns is a bit like going back in time. 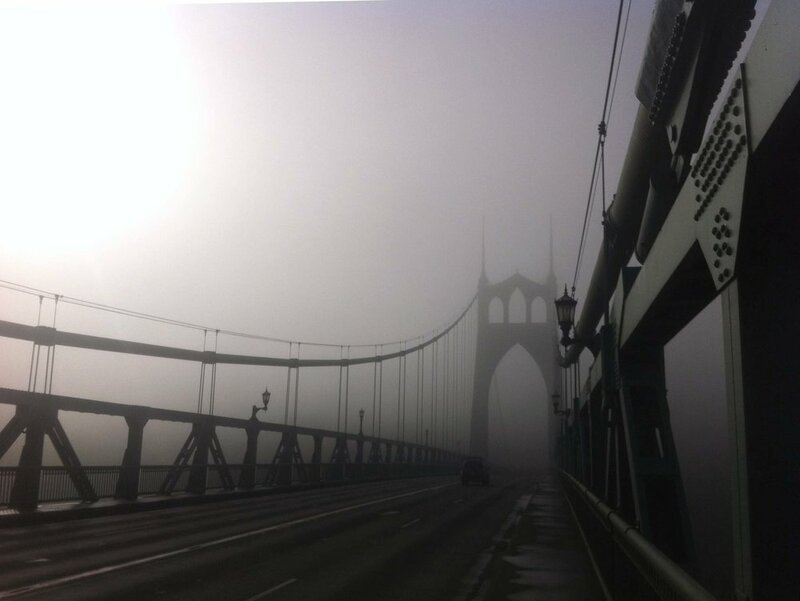 Even in the deep winter fog the St. Johns Bridge is stunning.